New York circa 1905. "The elevated." I think the most interesting thing here is the wonderful signage. 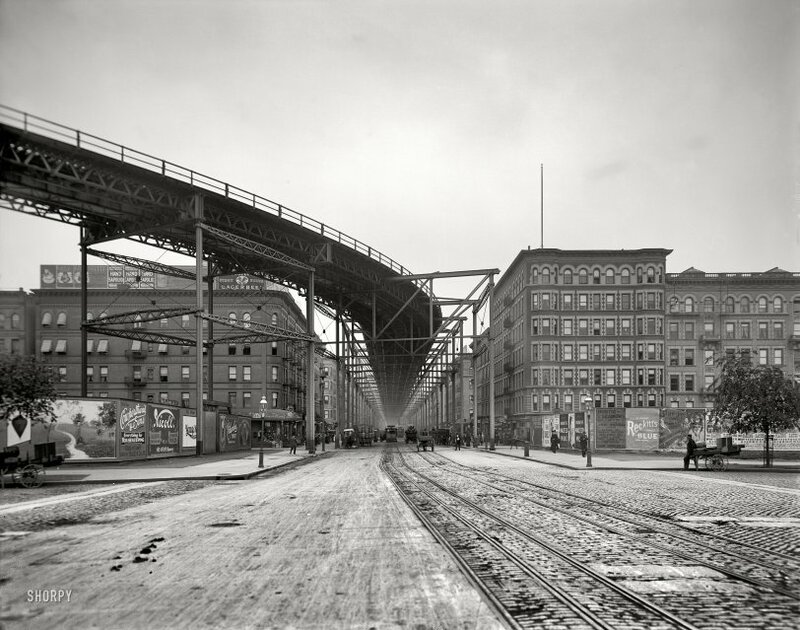 8x10 glass negative, Detroit Publishing Co. View full size. Submitted by shallnot on Sun, 04/29/2012 - 11:58am. The Morningside stairs may look similiar but the Central Park stairs look exact (allowing for 107 years of change). Submitted by jimboylan on Thu, 09/15/2011 - 1:15am. The Elevated had to be so high because it was crossing the Manhattan Valley without descending into it. The Broadway Subway crosses this same valley on a high arch bridge at 125th Street. The 110th Street station, shown in some of the linked photos, has its own elevator house on the north side of the street. A film clip in the Library of Congress movie collection "Life of a City" has a slightly older view of this curve with steam trains before electrification and the construction of the 110th Street station. Submitted by Michael R on Tue, 09/13/2011 - 4:51pm. Because the apartment buildings seen here match those in this view looking north on Eighth Avenue -- they are at the NW and NE corners of 8th Avenue and 111th Street. In addition, the stairway that John Craft showed us in the corner of Morningside Park hugs the line of the street (Morningside Avenue) very closely, while the stairway in this picture descends into the park at a 45-degree angle. Has this stairway been removed and replaced by a roadway? Submitted by Kilroy on Tue, 09/13/2011 - 12:52pm. And I think I found the stairs here. 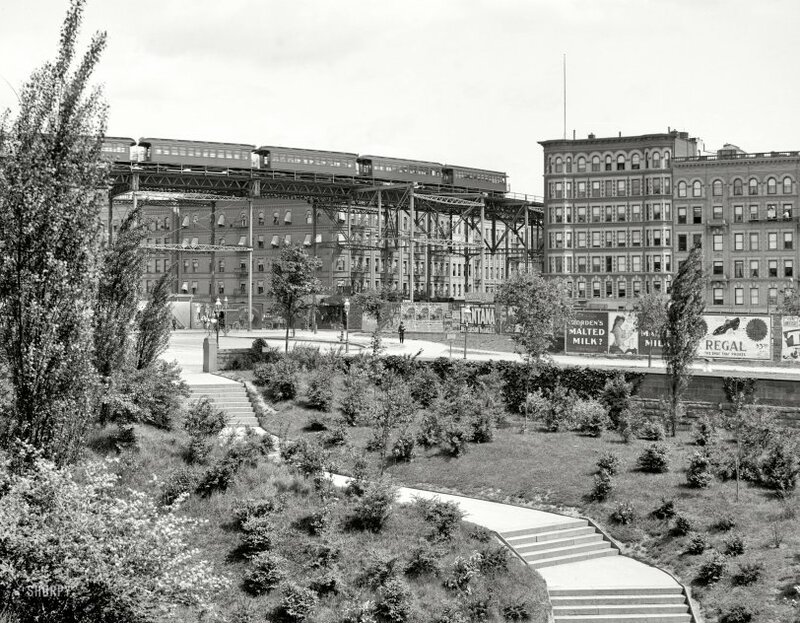 This photo is looking out on to what is now Frederick Douglass Circle. Submitted by John Craft on Tue, 09/13/2011 - 6:59am. Are we sure this is Central Park? That stairway looks very similar to this one in nearby Morningside Park. Submitted by Flatbush on Mon, 09/12/2011 - 7:22pm. If this is indeed 1905, there is an ad on a fence for the inaugral Belmont Park race meet at Elmont, Long Island. Submitted by Lost World on Mon, 09/12/2011 - 1:13pm. Submitted by HistoryBuffer on Mon, 09/12/2011 - 10:46am. You sure that's New York? Where's the graffiti on the trains? Submitted by Sean Ryan on Mon, 09/12/2011 - 11:35pm. I believe the billboards act as a fence hiding a vacant lot or construction site. It was a common practice at the time. Submitted by tritone on Tue, 09/13/2011 - 7:41pm. I think the sign near the top-right is an ad for the painters on the scaffold. It looks like an initial letter, followed by the word ZAM, and then the word PAINTER on the 2nd line. I think he is painting the inside of the window sills with a dark color. Notice how dark the inside of all the window sills to his left appear. Possibly he is just finishing up the sill in front of him. Notice all the sills directly below him are still a lighter color. The sign could be stuck to that window, but it might also be attached to his scaffold. Thanks for the blow-up, Dave. I just noticed there is a 2nd painter standing to the left of the sitting painter. 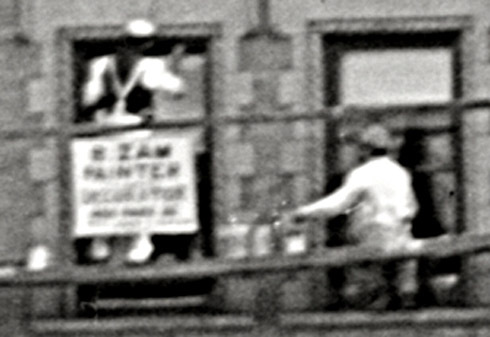 He looks to be wearing overalls and his right hand is raised to the glass, probably with paintbrush in hand! Submitted by Al Vyssotsky on Sun, 09/11/2011 - 12:38pm. Jefferson De Angelis performed in "Fantana" from Jan 14, 1905 - Sep 30, 1905. Several of the billboards are advertising events in May, including two on May 8. Interesting how closely the picture can be dated. I wonder how often the billboards were changed back then. I bet pretty often, as that was a major form of advertising then. Submitted by tychoanomaly on Sun, 09/11/2011 - 12:16pm. Fantana (with Douglas Fairbanks) opened at the Shubert's Lyric Theater in January 1905. Submitted by capt subway on Sun, 09/11/2011 - 11:49am. As noted in several comments above, it is indeed the "S" curve on the 9th Ave el at 110th Street & 8th Avenue, viewed looking roughly northwest from inside Central Park. The location was notable as the highest point anywhere on the New York els, being approximately 110 feet above street level. The 9th Ave line was closed and razed in 1940, having been replaced by the far superior 8th Avenue subway. Today the highest point on the NYC Transit system is at the Smith & Ninth station on the F & G lines in Brooklyn, which is 80+ feet above street level. Submitted by lesle on Sun, 09/11/2011 - 11:54am. No lack of Malted Milk there. Dave, don't know if you're flagging the usage or the word. It's a verb used as an adjective, with -ing making it a present participle. The word means smarten, spruce, in the sense of making better, enhancing. I deliberately did not use titillate. It's a close call, maybe a stretch, you may be right, but I'll stick with titivate. Kind regards. Submitted by TomK on Sun, 09/11/2011 - 11:21am. Submitted by TimeAndAgainPhoto on Sun, 09/11/2011 - 11:14am. Previously seen here on Shorpy. Submitted by Dutch on Sun, 09/11/2011 - 11:12am. Isn't that King Kong reaching for the elevated train from behind the building? What a great scene that was, and plenty scary for the times (1933). No doubt it gave elevated passengers pause before boarding for a while, like taking showers after seeing Psycho. I hope someone can identify the brand advertisement on the right edge. Tenth Anniversary for something starting with at T. Any train photos are great - thanks for posting Dave. Submitted by Michael R on Sun, 09/11/2011 - 11:11am. This looks like the famous S-curve of the Ninth Avenue L at 110th Street and Eighth Avenue in upper Manhattan, with a bit of Central Park in the foreground. This portion of the line was opened by the Manhattan Railway in 1891, leased to the Interborough Rapid Transit Co. (IRT) in 1903 (for 999 years! ), and closed to service when the city bought all the privately owned NYC subway and elevated lines in 1940. Another view of the curve was published by Shorpy here: https://www.shorpy.com/node/8002 . Submitted by Mr Mel on Sun, 09/11/2011 - 11:00am. "Bordens Malted Milk Has No Equal"
Or any other artificial sweetener. Submitted by Sgt McG on Sun, 09/11/2011 - 12:16pm. Folks in the DC area are well aware of Metro's constant battle to maintain its escalators ('escalator' being an ancient word meaning "mechanical staircase not meant to be left out in the rain"). Folks riding this train had an el of a climb. Seen here before from a different angle? Submitted by automat on Sun, 09/11/2011 - 10:42am. The same place, or a similar one, was seen in this 1905 photo. Submitted by keating35 on Sun, 09/11/2011 - 12:48pm. This was the famous "S" curve on the Sixth/Ninth Ave El at Cathedral Parkway and, because I can't tell if the photo has been reversed, it appears to be where the line curved to go up 8th Ave at the NW corner of CP. The billboards throw me off since I can't imagine why they would have been placed facing CP in front of the buildings at ground level. Submitted by GlenJay on Sun, 09/11/2011 - 10:12am. 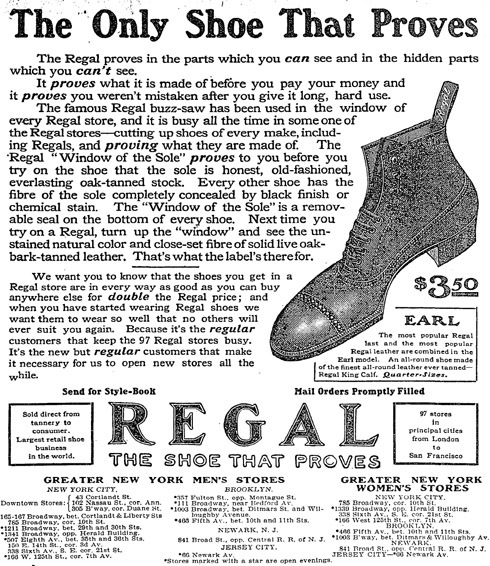 That buzzsaw device on the shoe billboard looks just right for the depicted shoe. Submitted by switzarch on Sun, 09/11/2011 - 9:27am. Those signs are cool, but that track is easily 6 stories up, I wonder why it had to get to that height along this stretch. That could translate to an easy 75 to 80 feet UP. No wonder King Kong was able to wreak havoc as he did. Submitted by MEGGAHURTZ on Sun, 09/11/2011 - 4:33pm. I am going to take a wild guess here but it looks like the old Third Avenue elevated in the Bronx. Also notice the elegance of the latticework steel including the star on the crossties. As others have noted it is the old Ninth Ave. El I stand corrected.